Garden Homes Management has proposed a 54-unit apartment building for a vacant lot on Fairchild Avenue. 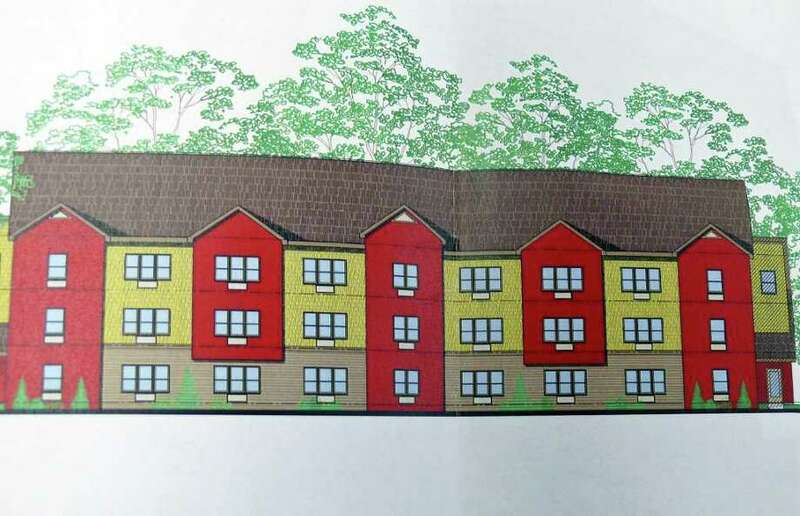 A Stamford-based developer wants to build 54 studio and one-bedroom apartments on a vacant lot at 130 Fairchild Ave., with half of the units set aside as affordable. The Town Plan and Zoning Commission accepted the application Tuesday for a public hearing, although a date has not been set. Of the apartments, 27 would be set aside as affordable, according to John Fallon, the developer's lawyer. The application for the 1.5-acre property on the short street off Kings Highway requires a zone change from residence B to a designed residence district, and some modifications to zoning regulations. "In constructing only studios and small one-bedrooms, our target market is primarily single working people under 35 and secondarily senior and other adult residents," Fallon said. Units at the proposed Fairchild Apartments would range in size from 500 to 520 square feet and include granite counter tops, dishwashers and microwaves, tiled kitchens and baths, walk-in closets and high-efficiency heating and air-conditioning units. The building would also house a central laundry room and fitness room. The project's site, bounded by Interstate 95 and the Rooster River, is nearby several multi-family homes on Rutland Avenue. The apartments would be housed in one three-story building -- 12 one-bedroom units and 42 studio apartments, some of which have a defined sleeping area. One-third of the ground-floor apartments would be accessible for people with disabilities and eight units would be set aside for residents earning less than 60 percent of the statewide median income, $36,120, and another eight units would be reserved for residents earning between 60 and 80 percent of the statewide median income, or up to $44,950. Another eight units would be reserved for "very low income" residents, or those who earn less than 50 percent of the statewide median income, or $30,100 and three units for "extremely low income" residents, who earn less than 30 percent, or $18,100, of the statewide median income. The developer, Garden Homes Management, is a family business that owns, manages and develops residential housing. In this area, the business has several housing complexes, including Beechmont Gardens in Bridgeport, Flax Hill Apartments in Norwalk, 397 Post Road Apartments in Darien and Golden Hill Apartments in Milford. Recent projects include the Darien units and three others in Stamford. All four of the projects, like the Fairfield proposal, have affordable housing units. In the town's strategic plan submitted to the federal Department of Housing and Urban Development as a condition of receiving Community Development Block Grant funds, it states: "Decent, affordable rental housing is considered a high priority need for extremely low and very low income renters in all categories. The town does not have a large supply of rental housing, affordable or otherwise; however much of what rental housing exists could be considered seasonal or student housing."